There's a new manager at Seven Lakes Stables, Director Bob Darr told members of the Seven Lakes Landowners Association Board during their Monday, March 10 Work Session. Amanda Duggan has been hired as the new manager, replacing Kate Pennington, who resigned earlier in the year. Darr said Duggan has added Sunday hours to the stables schedule, and the Association has acquired a new horse — a 16-hand, 1300-pound blonde gelding. The stable crew plans to ask the community's help in naming the new addition to the herd. Darr said the jury is still out on whether to return a leased horse named "Bandit," who exhibited some unruly behavior on one occasion. "We will probably wait and see if he continues to be a good boy," Darr said. Riding lessons are available and may be scheduled through the stables staff. "There are currently no plans to take any horses off of the property," Darr said. "If we get to the point that our kids are competitive, that will come back to the Board." Moore County Schools will be on a two-hour delay for all students and staff, Tuesday, March 4. With I’s dotted and T’s crossed, the Seven Lakes Landowners Association [SLLA] Board of Directors voted unanimously to accept the revised and updated SLLA Bylaws during the Wednesday, February 26 Open Meeting. After months of edits, discussion, and fine tuning there was nothing left to discuss. The board and audience applauded the efforts and final draft. The Association has adopted two options for monthly payment of dues. Landowners can chose up front to make monthly payments either by check or by auto draft over the course of the year, but may not use a check one month and auto draft the next. Or landowners may choose the time-honored option of paying the entire year's dues at once. Those paying monthly will incur an annual $50 administration fee, plus interest of one percent per month on the outstanding balance. The Westside Board is recycling talent. Active volunteer Mercedes Herdrich has served on the Finance Committee, Judicial Panel, Beacon Ridge Committee, Safety and Security Committee, and Boat Registration Committee. And now, she'll serve on the Board as the Treasurer of the Seven Lakes West Landowners Association [SLWLA]. The SLWLA Directors voted during its regular Tuesday, February 25 meeting to add Herdrich to the panel and appoint her Treasurer. Prior to her retirement in 2001 Herdrich's career was in finance. She will fill the position left open by Don Freiert, who had acted as the interim treasurer after Dale Erickson’s resignation. After the Board voted to appoint her, Herdrich presented the Treasurer’s report, noting that timely collection of dues continues to be a challenge. Currently, 54 delinquent accounts owe the Association a total of $36,595. The Moore County Sheriff's office has arrested 71-year-old Jon Bruce Sheroff of 202 Buckler Avenue in Aberdeen on a felony assault charge, alleging that he attacked Margaret Sheroff of Seven Lakes West. The Sheriff's Office received a call on the evening of Tuesday, February 25, requesting that deputies respond to 105 Sheroff Lane. The caller advised that an assault had occurred at the residence, and the victim had been stabbed during the altercation. Sheriff’s deputies and an EMS Paramedic Unit responded to the scene and found that 70-year-old Margaret Sheroff had received several lacerations to her face, arms, and chest. Mr. Sheroff, the suspect, was also at the scene when deputies arrived and was taken into custody. Ms. Sheroff was transported to the Moore Regional Hospital Emergency Room for treatment of her injuries. She was later admitted to the hospital, but her injuries are not believed to be life threatening. Sheriff’s Office Investigators arrested Jon Bruce Sheroff on February 26, charging him with one count of felony assault with a deadly weapon with intent to kill inflicting serious injury. Sheroff was placed in the Moore County Detention Center under a $100,000 secured bond. His first court appearance is scheduled for March 11, 2014 in Moore County District Court. Moore County records list Jon and Margaret Sheroff as co-owners of the home on Sheroff Lane. Public input and a field trip to Elise Middle School in Robbins apparently convinced half the members of the Moore County Board of Education that closing the school and enlarging Robbins Elementary to serve grades K-8 did not have a place in Moore County Schools' Master Facilities Plan. On a four-to-four tie vote, a motion by Board Member Laura Lang to merge the two schools failed, with Bruce Cunningham, Ed Dennison, Dale Frye, and Charles Lambert voting to keep Elise open. "One of the things I keep coming back to," Cunningham said, "is that two of our Growing to Greatness pathways are are culture and community." Remarking that he had recently read a book called "Elise High School in Upper Moore County," which traces the history of the school since its founding in 1904, Cunningham said, "These kids are part of history and they are part of the culture and the heritage of that school." "That school is downtown," Cunningham added. "What are the prospects of the Town of Robbins taking it over? They can't afford it. It is not going to happen. I don't think there is going to be an alternative use. I think we will end up with a blight on downtown Robbins if we abandon that facility." Both Elise and Robbins Elementary are "working well," Cunningham said, "students studying, teachers teaching well, things were clean . . . If it isn't broken, why fix it?" He also noted that, unlike Highfalls and Westmoore, both K-8 schools serving roughly 300 students, A K-8 Robbins Elementary would have 677 students "in a building that wasn't designed to do that and that has already been modified once." Prime real estate is about to become available in Seven Lakes South. After lengthy negotiations last year with Seven Lakes Country Club, The Seven Lakes Landowners Association [SLLA] accepted nineteen undeveloped lots owned by the the Club on which dues had not been paid for a number of years. “It was the belief that, if the Country Club owned the lots contiguous with the golf course, then the Country Club did not have to pay the Association dues on these lots,” President Steve Ritter explained during the SLLA Board's Monday, February 10 Work Session. “[SLLA Treasurer] Conrad Meyer started doing an audit and uncovered all of this." The Association's governing documents prevent it from offering that sort of waiver. Adding the nineteen lots to another nineteen already owned by the Association brings the total number of SLLA-owned lots to thirty-eight. Meyer and Ritter formed an ad hoc committee to evaluate the salability of the lots. Meyer provided the Board with a spreadsheet profiling the lots. “Eleven lots look like they are good candidates to sell," he said. "The question is: How much water do you want to have on your lot?” He also noted that several of the lots had the potential to be common area. Local builder and developer Ron Jackson tells The Times that he does not currently own — nor has he ever owned — any of the Foxtail Lane properties or unfinished foundations that have been regularly discussed at Foxfire Village Council meetings during the past twelve months. 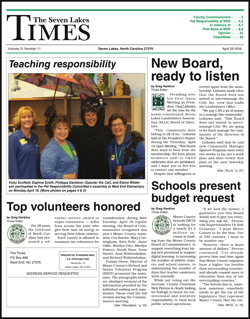 Late on Friday afternoon, February 7, after the latest edition of The Seven Lakes Times had found its way to the mailboxes of our readers, Jackson called to respond to a front page story on the Council's Thursday, January 30 Work Session. We reported that Council members discussed and then resolved to pursue fines against Jackson because the continued presence of three unfinished foundations on Foxtail Lane violates a Village ordinance. Because homes in the Foxtail Villas development are duplexes, the three foundations actually sit on six lots. Jackson said he does not own any of the six lots. He, personally, had never owned any of the lots, he insisted, adding that "my signature has never been on anything about those lots." Four of the properties, he said, were sold to Wells Fargo in December. The other two had also been sold, Jackson told The Times, though he said he was unsure of the identity of the new owner. It takes some moxie to run for and serve on the Seven Lakes Landowners Association [SLLA] Board of Directors. Candidates Paul Chavez, Mary Farley, Sandy Sackmann, and Chuck Leach spent a hour on Wednesday, February 5 being peppered with questions about Association policy and direction. During the meeting the candidates, provided brief biographies and explained why they are running for the Board. The audience submitted written questions to be asked by the moderator. You'll find our reports on each candidate's comment below.